Louise Philbrick was born and raised in Maine. Her affinity for gathering objects began as a child when she arranged her grandmother’s button collection, catalogued the rocks she mined from local quarries, and filled her pockets with objects scavenged from the beach and woods near her house. She discovered an inclination toward languages when in high school, enabling early employment with international companies in New York and Connecticut. Through her work as a sales representative for a Belgian steel mill, she eventually became more intrigued by the mechanical, chemical, and aesthetic properties of metal than by brokering it. Philbrick returned to Portland, Maine, to study sculpture with Michael Shaughnessy and Duncan Hewitt at the University of Southern Maine where she earned her BFA in 1996. Her work has been widely exhibited in Maine at galleries including Aucocisco Galleries, Aarhus Gallery and The Harlow Gallery. She is affiliated with I. Wolk Gallery in St. Helena, California, Ma(i)sonry in Yountville, California and Erdreich White Fine Art in Boston, Massachusetts. 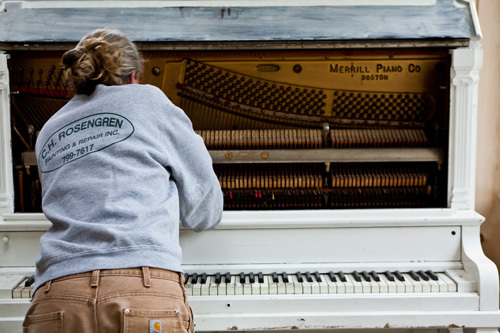 As part of its series for “Maine Things Considered” called “Works in Progress,” Maine Public Broadcasting Network aired the radio piece "Piano Artist" (produced by Patty Wight) about Louise and her work in August, 2012. She was also interviewed at that time by Daniel Wakin of The New York Times for his article “Where A Condemned Piano Can Win Appeal.” Boston Home Magazine featured Louise in the article "Artisan Next Door: Key Player" published in their Fall 2011 issue. Louise lives and works in South Portland, where she shares her home with two cats and her studio with thousands of piano parts.